The U.S. Deputy Assistant Secretary of State, Walter Douglas, visited Samoa this week. During a reception at the U.S. Embassy Compound in Vailima on Tuesday, he expressed how impressed he was with the Samoan hospitality. He acknowledged the new Country Director, Gini Wilderson, who was among the crowd. “And right now there are volunteers spread out all over the world,” he said. He said Samoa is part of the Asia Pacific region that the United States Government contributes and commits to. He is very interested in the region. “I can tell you from back in Washington that people say you the East Asia Pacific Bureau that you are the lucky girl because there is so much interest from the White House,” he said. Mr. Douglas said they are also a contributing member to the Pacific community. For the environmental programme they support, it’s important to manage and protect the oceans and fisheries resources. 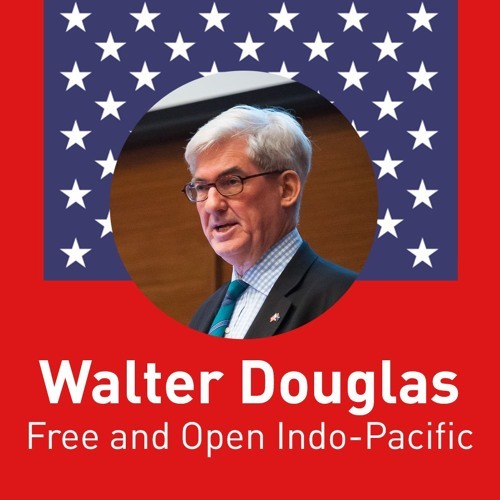 This includes American Samoa, where Mr. Douglas says U.S. is American Samoa’s second largest trading partner and third largest sources of remittances. “Trade expanding where Samoa beverages are now exporting to Hawaii and the West Coast and in the organic farming area, you are making valuable contributions in coconut oil, cocoa, turmeric and other products and its ending that it really something that is supporting farming here,” said Mr. Douglas. According to a statement released by the U.S. Embassy Samoa, Mr. Douglas is the Deputy Assistant Secretary of State for Public Affairs and Public Diplomacy [JB emphasis] and for Regional and Security Policy in the Bureau of East Asian and Pacific Affairs at the U.S. Department of State in Washington, D.C. Mr. Douglas was previously the Deputy Assistant Secretary of State for International Media Engagement in the Bureau of Public Affairs. Before that, he served overseas as minister counselor for public affairs at the U.S. Embassy in New Delhi. Earlier, Mr. Douglas was a senior visiting fellow at the Center for Strategic and International Studies (C.S.I.S.) in Washington, D.C.
His report “Engaging the Muslim World: Public Diplomacy after 9/11 in the Arab Middle East, Afghanistan, and Pakistan” was published in 2013. Until October, 2011, Mr. Douglas was based in Islamabad as the director of communications for the U.S. mission in Pakistan. Before that, he served in Washington as executive assistant to the Under Secretary for Public Diplomacy and Public Affairs and as the director of the office of press and public diplomacy in the Near Eastern Affairs bureau. This followed a tour as public affairs officer at the U.S. embassy in Riyadh, Saudi Arabia. Mr. Douglas also served as a public affairs officer at U.S. diplomatic missions in Turkey, Cyprus, and Iceland. 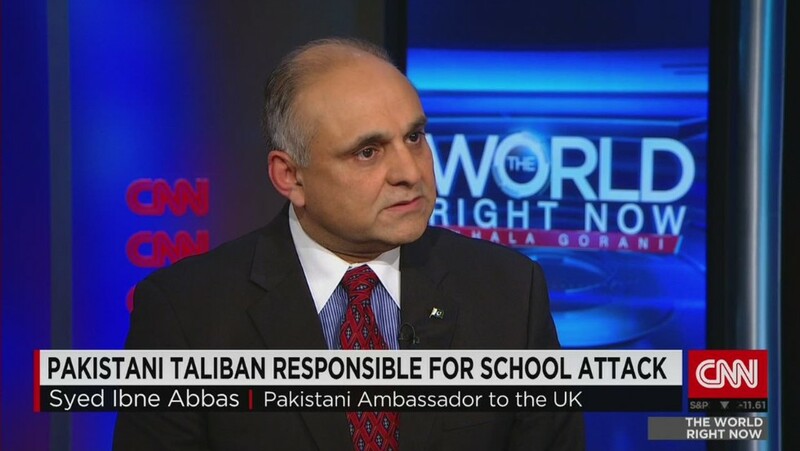 He was deputy to the spokesman at the U.S. mission to the United Nations when Madeleine Albright was ambassador. Earlier, he served at the U.S. missions in South Korea and Cote d’Ivoire. 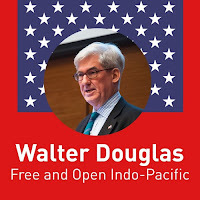 Prior to joining the Foreign Service, Mr. Douglas worked as an advertising executive in New York and as a legislative assistant to a member of the U.S. House of Representatives. Mr. Douglas graduated from the University of Pennsylvania with a B.A. in history. ‘This queue is a pleasure to watch,’ said Ukrainian President Petro Poroshenko as he made his way through the crowds at the International Arsenal Book Festival in Kyiv in May last year.Some 50,000 people visited the fair, 150 publishing houses displayed their works and hundreds of events were held under the vaulted ceiling of a huge Tsarist-era arms factory that is now one of Ukraine’s leading museums. The festival is part of a cultural explosion in Ukraine which embraces cinema, theatre, literature and publishing, documentary making, contemporary arts and fashion. It is this vibrancy in Ukraine’s cultural scene that prompted Vladislav Davidzon, a New-Yorker of mixed Jewish-Russian parentage, to come to Ukraine and set up its first cultural journal,The Odessa Review. ‘I’m really attracted to the cosmopolitan aspect of contemporary Ukrainian culture where everyone is bilingual and everyone is starting to learn English,’ he says. Just like the book fair, The Odessa Review is on a mission to promote the intellectual and artistic renaissance prompted by the tumultuous events that have swept Ukraine in recent years − the ‘Revolution of Dignity’ on Kyiv’s main square in 2013-14, the Russian annexation of Crimea and the Moscow-backed war in the east. These have fed a nationwide debate about Ukrainian identity and the cultural markers that come with it. Two views on identity collide here. The conservative nationalist camp talks of glory, heroes and Ukraine’s liberation struggle, past and present, including the war in the east of the country. Films, books, exhibitions, both state-sponsored and grassroots-based, boost Ukrainians’ patriotic spirit. One of the recent releases, Kiborhy (The Cyborgs), about the Ukrainian defenders of Donetsk airport, set a record at the box office of 22 million hryvnas (£600,000). All over the country Lenin monuments have been toppled, first as part of a spontaneous movement and later supported by state policies of ‘de-communization.’ These include a ban on Soviet symbols, the return of historic names to streets and towns and the removing of Soviet-era mosaics. So far, 1,320 Lenin statues have been taken down in Ukraine. The right-wing cultural conservatism is opposed by the ‘liberal’ camp. It is no less patriotic, but ‘it is civic nationalism, not of an ethnic kind’, Davidzon says. ‘Liberals’ promote a more inclusive view of Ukrainian identity, a more nuanced approach to history and a conservationist approach to Soviet material culture. They ask some searching questions: should Ukraine glorify the Second World War nationalist organizations whose members took part in anti-Jewish pogroms in Nazi-occupied Ukraine? Should we denounce Russian, which many Ukrainians consider their mother tongue, as ‘the language of the aggressor’? Should we deface Soviet mosaics, some of which have real artistic value? A debate, in public space and in social media, rages on. ‘In our cultural policies, there’s this mélange: conservatives versus liberals who are now managing budding cultural institutions according to new standards. There’s no clear sense of direction,’ says Olesya Ostrovska-Lyuta, director of the Mystetskyi Arsenal, as the Kyiv cultural complex is known. What is clear, however, is the huge amount of energy exerted by Ukraine’s artists, curators and public intellectuals as they frantically seek to rediscover a lost cultural heritage which is little known to Ukrainians themselves, let alone foreigners. One of the Mystetskyi Arsenal’s latest ventures was a hugely popular display of avant-garde art from the 1920s known as the Boychukist style, after the Boychuk brothers. It flourished in the decade after the Bolshevik revolution when Moscow tolerated Ukrainian cultural expression but was tragically wiped out during Stalin’s terror. This style had a major influence on generations of Ukrainian artists but has never been shown in a major exhibition. Ukraine’s largest cinematheque, theNational Dovzhenko Centre, named after the film director Oleksandr Dovzhenko, lifted from obscurity a number of the 1920s and 1930s silent films and has given them a second lease of life by commissioning a soundtrack written by contemporary composers. 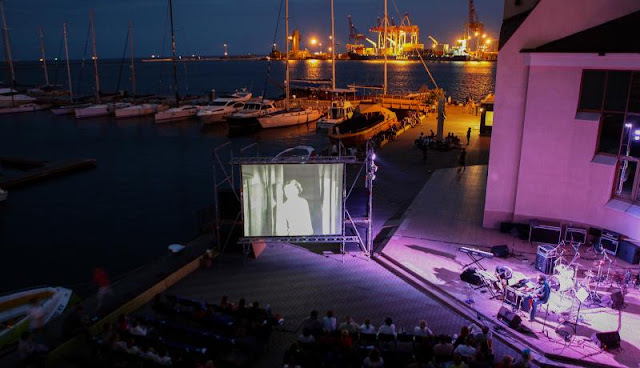 The films are all the rage with the hipster crowds in Kyiv and the Black Sea port of Odessa where the centre has annual outdoor gigs. The boundaries of what constitutes national cultural treasure are shifting. For centuries Ukraine has been contested by empires in which diverse ethnic communities − Ukrainians, Russians, Poles, Jews, Greeks, Crimean Tatars − lived side by side. Many are determined to cultivate this cultural mosaic, not brush it aside in the name of Ukrainian nationalism. In Lviv, close to the Polish border, local intellectuals admire the poetry of Debora Vogel, a pre-war Yiddish writer, virtually unknown to most Ukrainians, now lovingly translated. In Odessa, another city with a rich cultural tradition, hundreds gathered for a flash mob by the Opera House to hear extracts read aloud from the work of Isaac Babel, whose Odessa Tales chronicle the Jewish gangsters who held sway over the city in the 1920s. Babel died in Stalin’s purges in 1940. In Kyiv, the rebranding of Kazimir Malevich, an abstract artist firmly embedded into Russian cultural narrative, is underway. Malevich, a Pole born in Kyiv, who attended a local art school and lectured at the Kyiv Art Academy, should be marked as ‘a Ukrainian-Russian artist of Polish descent’, says Tetyana Filevska, an author and organizer of an international conference on Malevich in the Ukrainian capital. But Ukraine’s biggest cultural challenge lies in the east of the country where the war with local Russian-backed separatists has already claimed 10,000 lives and is still raging. A cultural divide between the Donbas − as the heartland of Ukraine’s coal and steel industries is known − and the rest of Ukraine is a topic endlessly chewed over in people’s kitchens, on television and at literary festivals. For decades Donbas was a near desert for Ukrainian culture, with Russian pop music and football being the preferred pastimes. While Donetsk and Luhansk, the biggest cities of the region, are still separatist-controlled, a string of smaller industrial towns on the Ukrainian side of the conflict have suddenly become a focus of a ‘cultural onslaught’: writers, singers, publishers, filmmakers and actors from all over Ukraine organize pop-up art galleries, stage public readings of books and produce experimental theatre plays with displaced people from the separatist areas as actors. Most of these initiatives are from the grassroots and have no state support. This powerful push from the public has stimulated the government to start changing its highly centralized approach towards cultural policies. Here, little has changed from Soviet times: the legislative field for Ukraine’s arts and culture is highly prescriptive, stifling creativity, making partnerships with the private sector difficult, says Ostrovska-Lyuta. But things are slowly changing. The first steps in promoting Ukraine’s image and brand abroad are being made. In 2015,Ukraine’s Ministry of Foreign Affairs opened a new department for public diplomacy [JB emphasis] and is making plans for a network of Ukrainian cultural institutes abroad. It is expected that the first branches will be launched in Paris, Berlin and Warsaw in 2018. Ukraine’s culture enthusiasts and its massive diaspora abroad are holding their breath. The training programs of Anadolu Agency for foreign journalists show Turkey's depth and strengthen academic standards in foreign countries, Assoc. Prof. Hatice Karahan, who is a senior economic adviser to the Turkish president, told Anadolu Agency on Wednesday. 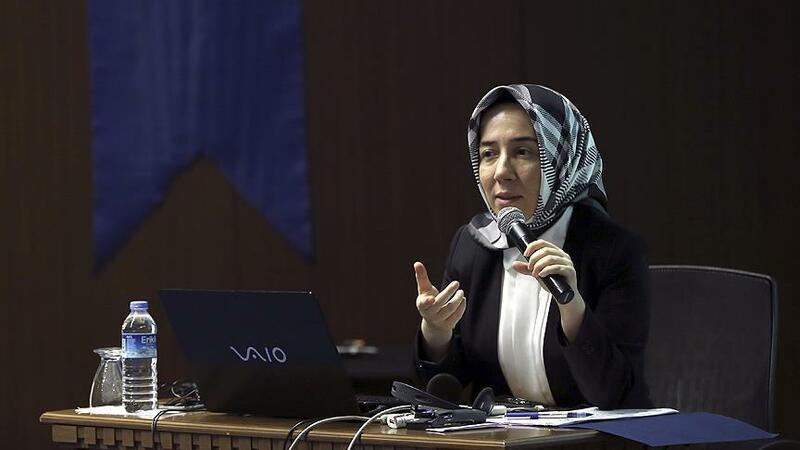 Karahan called the programs "productive diplomacy works" after she gave a lesson in “Economy and Finance Journalism Training”, which had been jointly organized by the Anadolu Agency News Academy and Turkish Cooperation and Coordination Agency. "Economy and finance training is important to prove that Turkey is a leading country in this area, and it also strengthens public diplomacy [JB emphasis]," she said. She said participants not only get to learn in detail about economy and finance, but they also found an opportunity to reflect on Turkish economy’s truer and more objective picture. "Trainees were keen to increase their knowledge of economy and finance; their attitude was positive as lessons proceeded; this is a success of Anadolu Agency News Academy," she said. A total of 25 journalists from Kazakhstan, Uzbekistan, Azerbaijan, Ukraine, Georgia, Mongolia, and Tajikistan were trained under the scope of Economy and Finance Journalism Training program by Anadolu Agency's editors and experts from Turkey's Central Bank, Turkish Statistical Institute, Economy Ministry, and Science, Industry, and Technology Ministry. Lessons on technology’s effect on financial markets, news sources, writing news methods, photography, and graphic were given in Russian and Turkish. The program will continue until Friday, at the end of which participants will receive certificates. Anadolu Agency organizes training programs in several journalism areas such as war, photo, corporation, diplomacy, energy and international. The China Lobby in the United States attracted much scholarly attention after 1945, yet it found its footing in the late 1930s and played a critical role in re-shaping American public opinion prior to World War II. Historians have devoted relatively little time to investigating this earlier period. The overwhelming majority of China’s lobbyists during these early years were American missionaries who the Chinese government often funded and managed. This article examines the role of two of those missionaries—Frank and Harry Price—and their American Committee for Non-Participation in Japanese Aggression. It relies on research in Taiwan, China, and in archives across the United States. The author also has interviewed members of the Price family, as well as former associates of Frank Price in the United States, Taiwan, and China. The evidence this article presents demonstrates that while difficult to quantify, the Price brothers played a crucial role in helping to re-shape American public opinion about China between 1938 and 1941. Heather Nauert worked in journalism starting in 1996, beginning with Fox News in 1998 and then going to several other outlets, including ABC. She returned to Fox in 2007, where she worked as an anchor for about a decade. She was an anchor on Fox & Friends, one of President Trump’s favorite shows. 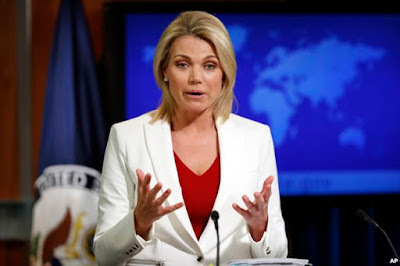 In April 2017, the Trump Administration announced that Nauert would be joining the State Department as its spokesperson. Then, in March 2018, she became the Under Secretary of State for Public Diplomacy [JB emphasis] and Public Affairs. Next: This Fox News personality became the White House Director of Strategic Communications. Mercedes Schlapp previously worked for the George W. Bush presidential campaign and was his Director of Specialty Media. But in recent years, she was a Fox News contributor. She also contributed to other outlets such as The Washington Times. Hassan Khan sat down recently with Syed Ibne Abbas, a career diplomat currently serving as Pakistan's High Commissioner to the United Kingdom of Great Britain and Northern Ireland. He has previously served as High Commissioner to New Zealand and Consul General in Los Angeles, California, USA. Q: The high commission has been working on various public and cultural diplomatic initiatives [JB emphasis] round the clock with the main highlight being promoting an ‘Emerging Pakistan’. 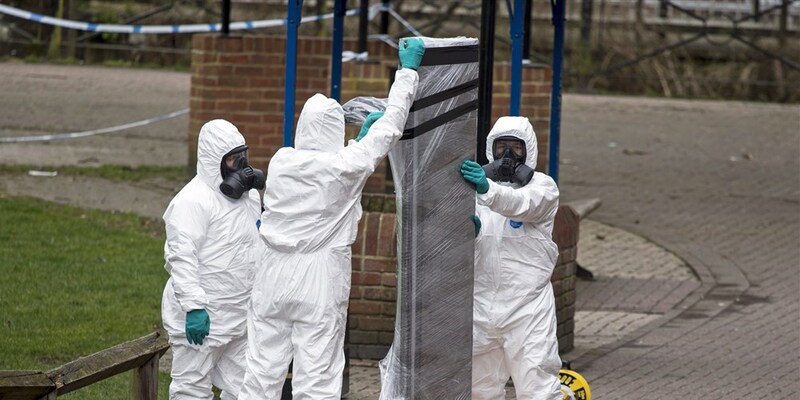 What kind of response has been garnered amongst the local community and London’s diplomatic circles? 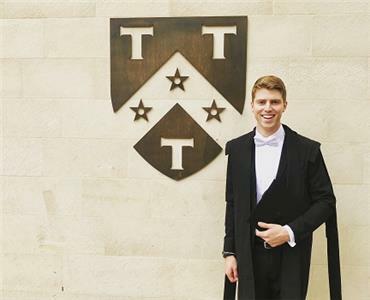 Jacob Wirz, Rotary District 6780's Global Grant Scholar, is pursuing a master's degree in global governance and diplomacy at the University of Oxford. There, his coursework focuses on the intersection of diplomacy and international law, while his independent research studies the effects of public diplomacy [JB emphasis] in the international arena. "Upon completion of his studies, Jacob will continue his service in the U.S. Navy, where he will be stationed on the USS Porter in Rota, Spain. Eventually, he hopes to use the knowledge gained through the Rotary experience to work to promote peace and stability by minimizing the possibilities of diplomatic miscalculation," officials said. At Oxford, Jacob is hosted by Rotary District 1090 and the Rotary Club of Eynsham, where he presented at one of the biweekly meetings. Jacob was awarded the District 6780 2017-2018 Global Grant scholarship and is sponsored by the Rotary Club of Chattanooga Hamilton Place. ‘This queue is a pleasure to watch,’ said Ukrainian President Petro Poroshenko as he made his way through the crowds at the International Arsenal Book Festival in Kyiv in May last year. Some 50,000 people visited the fair, 150 publishing houses displayed their works and hundreds of events were held under the vaulted ceiling of a huge Tsarist-era arms factory that is now one of Ukraine’s leading museums. It is this vibrancy in Ukraine’s cultural scene that prompted Vladislav Davidzon, a New-Yorker of mixed Jewish-Russian parentage, to come to Ukraine and set up its first cultural journal, The Odessa Review. ‘I’m really attracted to the cosmopolitan aspect of contemporary Ukrainian culture where everyone is bilingual and everyone is starting to learn English,’ he says. The first steps in promoting Ukraine’s image and brand abroad are being made. In 2015, Ukraine’s Ministry of Foreign Affairs opened a new department for public diplomacy [JB emphasis] and is making plans for a network of Ukrainian cultural institutes abroad. It is expected that the first branches will be launched in Paris, Berlin and Warsaw in 2018. Ukraine’s culture enthusiasts and its massive diaspora abroad are holding their breath. Image from article, with caption: State Department spokeswoman Heather Nauert. The United States on Thursday declared there is no justification for Russia’s retaliatory expulsion of American diplomats. The White House has said the like-for-like expulsions by Moscow “marks a further deterioration” of the relationship between the U.S. and Russia. The Under Secretary of State for Public Diplomacy and Public Affairs, Heather Nauert, also criticized Moscow’s actions, announced earlier in the day by Russian Foreign Minister Sergey Lavrov. Just hours before being summoned to the foreign ministry, Huntsman told VOA that one of his biggest regrets through all the challenges he has faced in his job was seeing the U.S. diplomatic cut by 727 last year on the orders of the Kremlin. That, he said, had severely impacted the embassy’s cultural outreach programs as well as the processing of visas. He worried visa processing would be even more deeply impacted, if Russia went ahead with further expulsions. How does the U.S. decide which Russians to throw out of the country? Robert Windrem, NBC; see also. 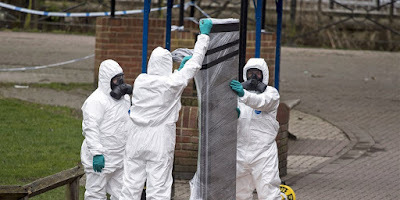 Image from article, with caption: Army officers remove the bench on March 23 where Sergi Skripal and his daughter were found in Salisbury, England, on March 4. Russia violated an unwritten rule of espionage, officials say: No assassinations on foreign soil. Richard Haas, the president of the Council on Foreign Relations [tweeted that] expulsions are "less than optimal" and "will likely lead to Moscow responding in kind," meaning expulsions of U.S. diplomats — an accurate prediction of what occurred Thursday. What's Behind China's Confused Communications? After Rex Tillerson, hard or soft power?